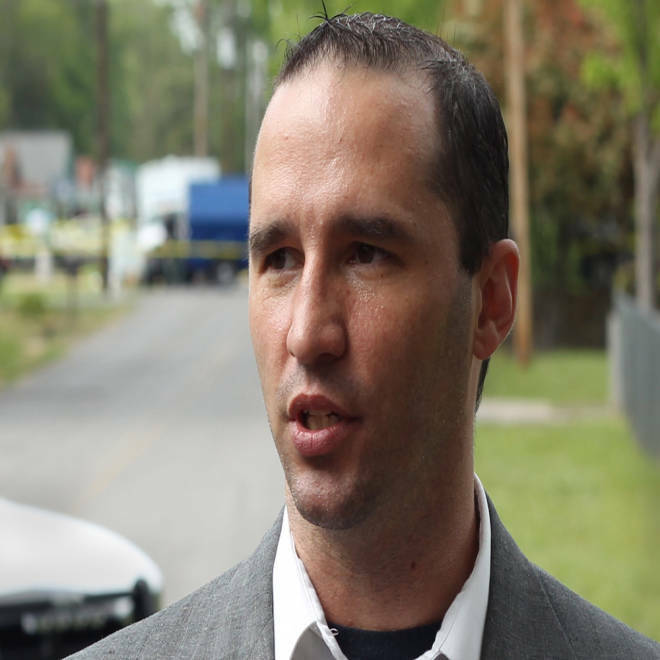 Everett Dutschke speaks to the media as federal officials search his property in Tupelo, Mississippi, on April 23. The FBI found traces of ricin in the former studio of a Mississippi martial arts instructor accused of sending poisoned letters to President Obama and other officials, and on a dust mask he chucked in a trash bin while agents were watching him, court documents show. An affidavit unsealed Tuesday also revealed that the suspect, James Everett Dutschke, ordered castor beans -- which are used to make ricin – on eBay last November and December. Other evidence outlined in the documents include documents from Dutschke’s home that appear to come from the same printer as the ricin-laced letters, computer records that show ricin-related downloads and text messages with his wife about “burning” and disposing of paperwork. Dutschke, 41, is being held without bond in the case – which originally focused on an Elvis impersonator with whom he’s been feuding for years. That man, Paul Kevin Curtis, was arrested two weeks ago but charges were later dropped. He has said he believes he was framed by Dutschke. A surveillance team was watching Dutschke when he entered his former dojo, Tupelo Taekwondo Plus, on April 22, removed a bunch of things and tossed them into a garbage bin on the street, the affidavit said. Authorities retrieved the items: a coffee grinder they said could be used for processing castor beans, latex gloves and a dust mask. The mask tested positive for ricin, as did swabs from the dojo, investigators said. “Because public safety is always the FBI's first priority in any investigation, that location was immediately sealed off and appropriate public health authorities were notified,” the FBI said in a statement. Ricin can be lethal, but an FBI agent testified in court that the variety found in the letters sent to Obama, Sen. Roger Wicker, R-Miss., and Judge Sadie Holland of Lee County, Miss. Wasn’t very potent. Dutschke, 41, has denied being the culprit. The FBI said that when they interviewed Dutschke, he denied ever buying castor beans, said he had not been back to his dojo and never threw away anything from the studio. When he was confronted with evidence to the contrary, “Dutschke attempted to change the subject, and he ended the interview,” the affidavit said.